Outside the Harley-Davidson Museum, there is a curved steel wall covered with rivets that have been personalized by their buyers. 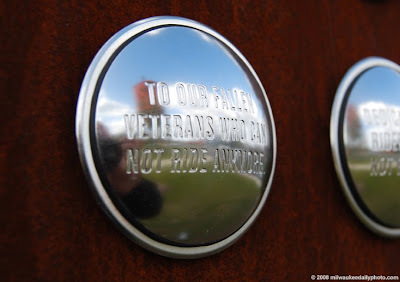 This one says "To our fallen veterans who can not ride anymore". On this Veterans Day, remember all that they have sacrificed to ensure our freedoms, and the freedoms of others around the world.